When Tiffany was born she had an unknown disorder that lead her to have Global developmental delays. The doctors thought she may never walk or talk. She was completely non-verbal until she was 8 years old. She also has physical problems and did not take her first step until she was 3 years old and could not sit on a normal chair with out falling off, She fell over every 5-6 steps and wore pediro boots, spinal belt and used a wheel chair. Artie was a big 17'2 thoroughbred, the gentle giant, he was very head shy as he did not have a good start in life and was hit by previous owners, he found it hard to trust new people and was a shy horse, he did not like his head or ears touched. And would only let people near him after you had gained his trust. From the moment they met they loved each other, Artie would groom Tiffany's hair and she would kiss and cuddle him, and they would play hide and seek in the sand school. The clicking turned into noises and the little lady we thought we would never hear the voice of found her voice. Then our herd grew again with the addition of a baby….. Yes its BEN. 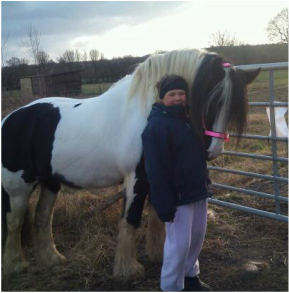 Tiffany was a bit upset as she thought he was going to be the size of a my little pony and not the size of Brennan..
Tiffany would babble away to the horse's she knew and loved and had spent lots of time with, and they seemed to know what she was talking about! Tiffany started taking them to shows and would proudly go into the ring with her VOCA that had pre programmed information about her and her horse. She showed In her pediro boots with her voca and in her first show got a 1st place rosette. Tiffany added more and more words to her vocabulary – starting with – Walk, trot and stand! The most used sign in our house was horse! Her Physio could not believe she could ride unaided as she was still falling of chairs at school and falling over thin air all the time – to this day she still uses a wheel chair for any kind of distances and suffers acute pain in her joints. But put her on a horse and she will ride for miles! Starting with my shy little girl who only felt safe letting her very close family and the horses hear her new voice into a little lady that was full of confidence…… and learned to talk more and more each day. 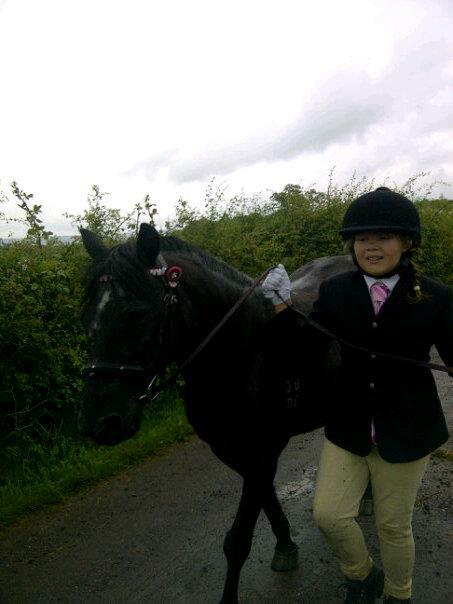 She needed a bigger pony and we rescued an adorable little black pony – Pudding, she takes time to trust but once she does you have a friend for life. Tiffany at age 9 went from saying 10 words to 100 words in a year! At this time she was not attending a school as she was awaiting a new SEN placement, she was only having speech therapy once a month. The next edition to our heard is Jigsaw – once tethered up she was a bit wary of new people but now she has as much confidence as Tiffany and they have an unbreakable bond now as they go for hacks round the farm. Tiffany is 14, she was signed off the communication team in 2014, they thought she would never communicate with people she did not know and cannot believe the amount of speech she now has. Tiffany is full of confidence and will now talk to strangers something no one thought she would ever do, she competes in shows talking to the judges and has qualified for county shows. 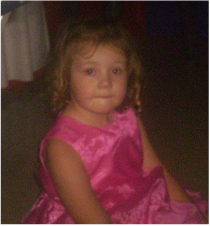 Tiffany is now diagnosed with global developmental delay, Autism hypermobility Syndrome, Ora-motor Dyspraxia, Dyspraxia, sensory processing disorder, low muscle tone, ligament laxity, flat feet, and a learning disability. Ben is now all grown up and ready to help those who need him, Pudding is the same loveable little lady that trusted us to help her and will now help others, and Jigsaw our newest herd member who was rescued from being tethered up and has grown to love us all as we love her has the gentlest soul and being Tiffany's new riding companion she understands the new job she has to do. Brenan is enjoying his retirement eating as much as he can! Sadly we lost Artie, but as our Founder he will never be forgotten, the bond we had with him will be forever and remain unbroken and he is always in our thoughts and hearts.